Tasha. 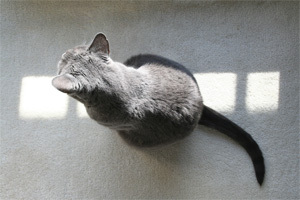 She's our eight-year-old (mostly) Russian blue cat. She's overweight and a real sweetie, very energetic. Beginning some time this afternoon, though, and ever since she has been vomiting frequently. Can't keep water or food down. It's like she's trying to clear something from her stomach or throat. Symptoms, so far, don't warrant a quick trip to the veterinary emergency clinic, but it's very worrisome. We'll see how she is tomorrow morning and go from there. Our home life right now seems dominated by two small animals and I guess it is. We value their welfare and quality of life and care deeply for them so when they have trouble we aren't inclined to simply "put them out of our misery." Here's hoping Tasha is feeling better by morning. Today's post about Tasha fills you in. Tash seems fine right now and hasn't had any problems we know about since taking her to emergency. She's upset she has no food or water but just try getting a cat to understand why that is! Hopefully she'll pull through this episode just fine. Thanks for your concern, Smileyface!